A few weeks ago I wrote about the book The Highly Sensitive Person. I'm certain that I'm an HSP and each of my kids shows signs of being highly sensitive. Dr. Aron has a questionnaire for parents to determine if their child is highly sensitive. She also has a book, The Highly Sensitive Child, although I'm still waiting on that one to come in at the library. In the mean time, I read two other books about highly sensitive children: Parenting the Highly Sensitive Child by Rosenshein and Raising Your Spirited Child by Kurcinka. Rosenshein's book is short and to the point. It is written in a very personal style and speaks from the author's own experience as a school social workers. She helps to explain differences between being highly sensitive and being ADHD. Though she has many helpful tips, readers might find her to be a bit outside of mainstream, since she readily accepts the idea of Indigo's, which tends to be considered a pseudoscience term for those with more spiritual powers and I believe refers to the color of one's aura. I still think the book is worth reading if you have a highly sensitive child because it's quick and to the point while still covering a lot of content. However, of the two books, I preferred Kurcinka's because of the depth and volume of material. It's nearly 500 pages and covers many facets of what it means to be highly sensitive. She describes the spirited child as, "more intense, persistent, sensitive, perceptive, and uncomfortable with change." The book starts by explaining that these characteristics are part of your child's innate temperament. She describes these traits in detail and has scales for each to help you identify where your child falls in the spectrum. As the book goes on, she devotes a chapter to each of these characteristics and has strategies for dealing with them. Some of the strategies reminded me of things from the book, How to Talk so Kids will Listen and Listen so Kids will Talk, that I reviewed previously. Again, emphasizing that we give validity and respect to the way a child feels and thinks. There are also whole chapters devoted to sleep, mealtimes, and getting dressed, which are areas that highly sensitive kids seem to really struggle with. We're currently struggling with Lucy's sleep, so I jumped first to the chapter on bedtime and night waking. I was bummed to see that there aren't any quick fixes, but relieved to find that the cry-it-out method doesn't tend to work well for highly sensitive kids - I just couldn't understand why Lucy wasn't ever stopping her crying, but apparently that's just part of her temperament! Overall this is a great book with so much valuable info - definitely too much to digest all at once, so probably one that I will check out again in a few months! 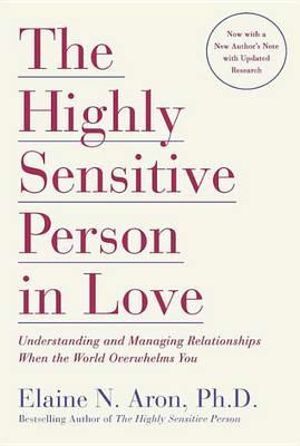 I also picked up another highly sensitive book for myself - The Highly Sensitive Person in Love, by Aron, the same author of The Highly Sensitive Person. I was a bit disappointed in this book. To me, it didn't have the same feel as her original book. It seemed a bit rambling and all over the place, plus it introduced a few too many new concepts, such as attachment style and sensation seeking. I also felt she used examples from her own life far too often, which made it more difficult for me to read it as a work of science. I would say it's not worth the read unless you are an HSP struggling in a relationship with a non-HSP. Be sure to check out more great books @ Housewifespice!